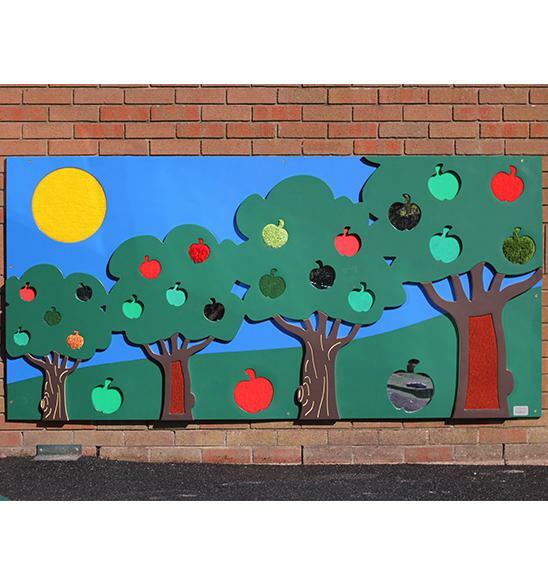 The Tactile Orchard Panel is a bright and colourful way for children to indulge their senses, with engraved apple shapes filled with various different textures; from artificial grass to play carpet, along with mirrored surfaces for further visual stimulation. It makes a fantastic playful backdrop to any playground and lends itself perfectly to children’s roleplaying scenarios. The panel is made from durable HDPE plastic, making it easy to clean and maintain for years of playtime fun. Various textures for tactile fun.